When sewing chiffon, many crafters layer tissue paper in between the two pieces being sewn together. The tissue paper helps keep the fabric together, with the rough surface of the tissue holding the chiffon in place while it is handled. After sewing, the tissue paper can be carefully ripped out. 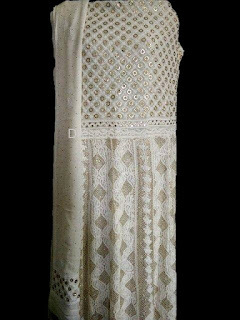 Chiffon is also pinnable, as it will spring back, concealing pin marks. As a general rule, sewers should work slowly and steadily with this fabric, taking care not to run it through a sewing machine too quickly or it will bunch and gather. Chiffon is most commonly used in evening wear, especially as an overlay, for giving an elegant and floating appearance to the gown. 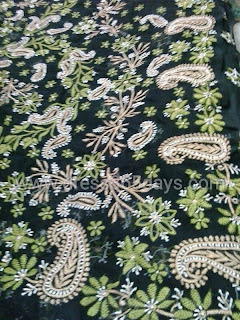 It is also a popular fabric used in blouses, ribbons, scarves and lingerie. Like other crêpe fabrics, chiffon can be difficult to work with because of its light and slippery texture. Due to this delicate nature, chiffon must be hand washed very gently. Since chiffon is a light-weight fabric that frays very easily, bound or French seams must be used to stop the fabric from fraying. Chiffon is smoother and more lustrous than the similar fabric georgette. Georgette (from crêpe Georgette) is a sheer, lightweight, dull-finished crêpe fabric named after the early 20th century French dressmaker Georgette de la Plante. Originally made from silk, and later rayon or rayon blends, modern georgette is often made of synthetic filament yarns. It is plain or tabby woven, and, like other crêpes, is made with highly twisted yarns. Its characteristic crinkly surface is created by alternating S- and Z-twist yarns in both warp and weft. Georgette is made in solid colors and prints, and is used for blouses, dresses, evening gowns, and trimmings. It is springier and less lustrous than the closely related chiffon.